Perhaps this is set to be the next dangerous millennial or Generation Z fad, akin to the 'Tide Pod Challenge' or the even more dangerous 'car surfing' of a few years back. A series of videos recently uploaded to YouTube shows a trio of teens riding atop subway cars at high speeds through Brooklyn and Queens. The daredevils filmed themselves jumping from train platform roofs onto trains, and leaping from car to car as if in an action movie while the trains hit full speed. An edited series of subway "surfing" scenes was published to YouTube on Wednesday, but after it was picked up by Drudge Report early Friday, the videos have since been been pulled. And as the videos featured close-up shots of at least a couple of the subway roof hoppers' faces, we expect the police may be already knocking on their doors. And in one prior clip uploaded a few weeks ago, also since removed, one of the teens actually falls off the train immediately after hopping on the roof. Apparently he survived and resumed the highly dangerous and illegal stunt. Also included among the video series originally uploaded by "Jack Sutton" was a filmed incident wherein one friend screamed to others to "duck quickly" before the train entered a tunnel. It appears the teens barely survived decapitation, with the young man behind the camera slipping down between the cars and inside a cabin at the last second. That particular video has also since been removed from YouTube. 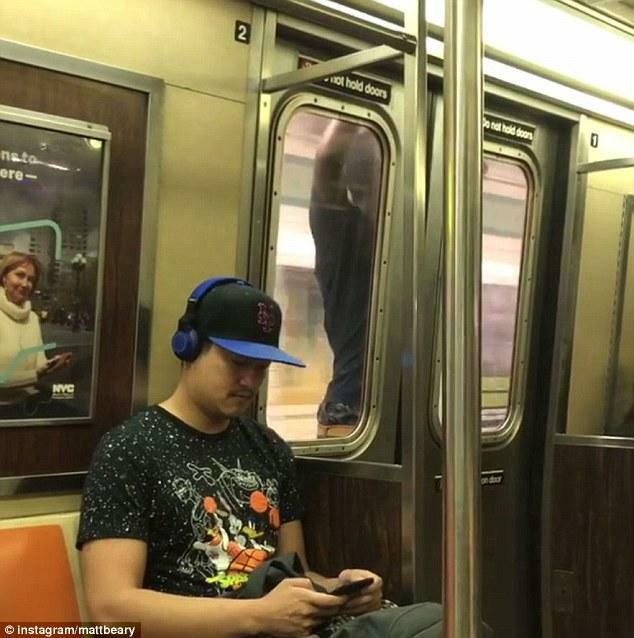 In a separate early July incident, a 22-year old man was arrested at his Brooklyn home after he was photographed by passengers hanging on to the side of a subway car in a extremely risky stunt, which wasn't his first time. There's no word yet on if the film-making daredevils behind the latest train surfing incident have been arrested, but clearly they were just lucky to survive.